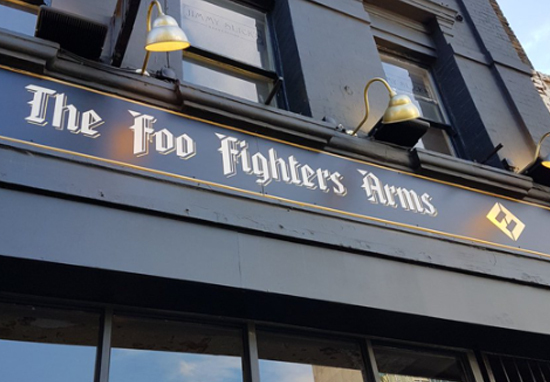 Foo Fighters have really gone the extra mile when promoting their new album Concrete And Gold , opening up a quintessentially British pub in the heart of East London. A punter at The Foo Fighters Arms can expect to sup down on a range of Foo Fighters themed beers, with names such as La Dee Da, Dirty Water and Concrete and Gold. The decor looks incredible – walls are lined with paintings of the band in traditional ye olde English attire, clutching lutes and special songwriting quills. The pub crest is super cool, and includes two dragon skeletons breathing fire. With the cosy historic boozer feel, and plentiful pints on tap, it seems Foo Fighters completely get their British fans down to a t. (We love you too, guys). By all accounts, The Foo Fighters Arms is the perfect place for fans to mingle and so far a good time has been had by all. There’s exclusive Foo Fighters merch to be purchased along with your round, including black print vinyls, t-shirts and even a Foo Fighters tea set. However, you will need to hurry up if you fancy a visit, as the pub is open for one week only (boo) from 15 – 22 September.